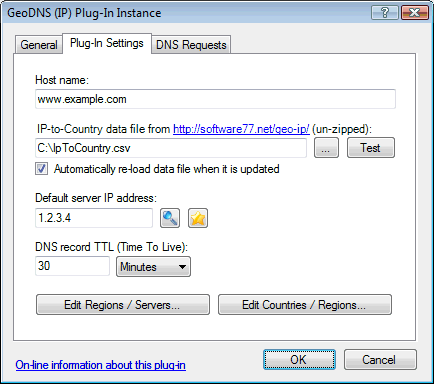 This plug-in provides a different DNS response depending on what country the DNS request originates from. This can be used to direct Internet traffic (web, FTP, streaming media, etc.) to a server geographically closer to the end-user, or with contents specific for a geographical area. Note that this is based on the IP address of the resolving DNS server sending the DNS request, which could be in a different country than end-user. However most end-users will typically be using a DNS server in their own country. 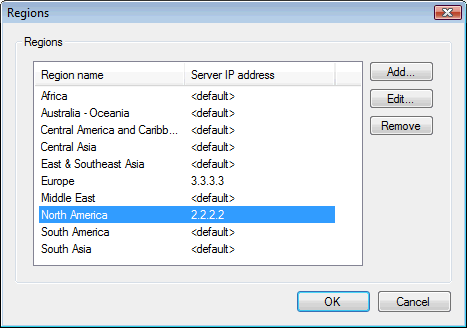 Countries are grouped into "regions" for each of which a unique server IP address/alias can be defined. 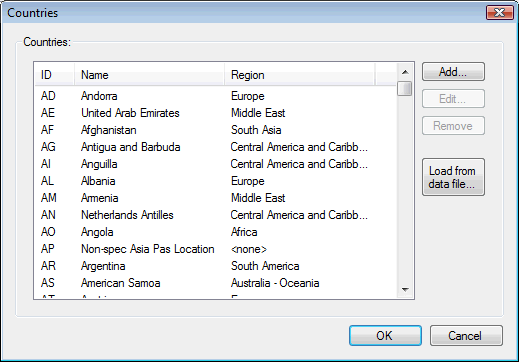 The plug-in is pre-configured with a default set of 10 regions (North America, Middle East, etc.) based on CIA's World Factbook, but you can configure this in any way that you prefer. There are two variants of this plug-in - "IP" and "CNAME" - both included in the same .dll file. The "IP" variant responds with a single server IP address (A-record). We recommend using this when you only have a single server (or multiple servers in a cluster behind a single IP address) serving each region. The "CNAME" variant responds with a server name alias (CNAME-record). The host name pointed to by this CNAME-record may represent multiple IP addresses (multiple A-records) defined elsewhere - for example a local or remote DNS zone or by another plug-in. This can be used when you have multiple servers on multiple IP addresses for each region -typically using round robin load distribution. Note that the "CNAME" plug-in variant requires an "unlimited zones" license for Simple DNS Plus. Enter the host name that you want to provide GeoDNS data for. For example "www.example.com". IMPORTANT: For the "CNAME" plug-in variant, always use a sub-name (like a "www." prefixed name) for which no other DNS records exist. Never use a zone name (such as "example.com") because the CNAME-record would conflict with the zone's SOA- and NS-records and cause various problems. If you want to allow end-users to enter your web-site address without the www prefix, you should point (using an A-record in the zone) the name without the prefix to a default web-server which redirects (via HTTP header) to the www version of the name - this is exactly what Google.com does. 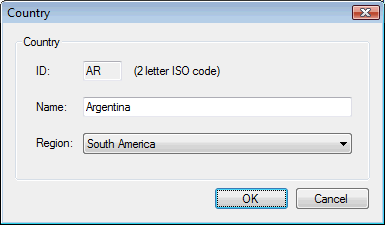 Specify the data file to use. Click the "..." button to browse the local file system and find the file. Click the "Test" button to get a count of IP address ranges and countries in the file, and to look up IP addresses in it. When checked, the plug-in will monitor the data file for updates. 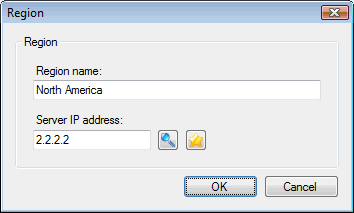 The server IP address / alias to serve if the country/region is not found or does not have a specific server IP address / alias defined. How long the DNS record served may be cached by other DNS servers / caches. 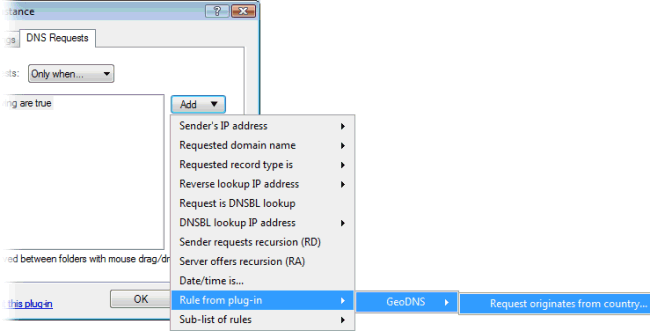 For an example of using this for blocking DNS requests from specific countries, see KB1292. - Update: Now allows multiple plug-in instances using the same IP-to-Country data file.